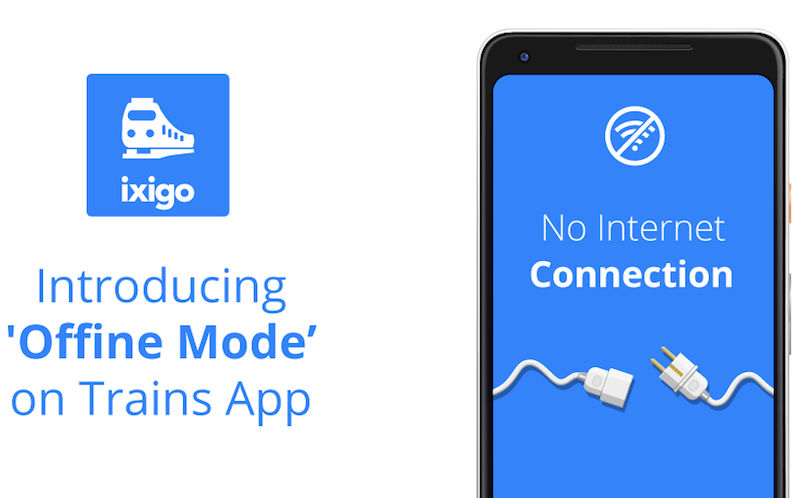 Homegrown travel and hotel booking e-commerce website, ixigo has introduced a new feature called ‘Offline mode’ on its Trains app for Android users. The added feature will help users to search for information about the travel routes, the train stops, and schedule, even when they are offline. The move comes as to keep in mind the constant hassle of connectivity problems users face when accessing the internet, which intensifies further during a train journey. In the absence of internet or perhaps a low network zone, the Ixigo Trains app will offer users the ability to view trains between stations, set station alarms, live train running status, receive booking reminders and search for train routes. With the offline availability of the Live Running Status feature, travelers will never have to fret over tracking their train location. This is not the first time when the company has launched such features. In 2016, ixigo had launched offline and without GPS cab booking on its cabs app, especially for places like airports, railway and bus stations. Users could then book from the cab service providers Uber, Ola, EasyCabs and Jugnoo on Ixigo cabs app. Launched in 2007, ixigo is one of India’s leading travel marketplace, which allows travelers to compare and book from 120+ travel suppliers and OTAs across flights, hotels, trains, cabs & destinations. The company currently serves more than 20 million monthly active users and manages 4 million trips every month with a user base of 100 million travelers on its platform.